The Club already has a network evolved at a federal level, and this extensive network is able to serve the massive flow of projects in any region and line of production. 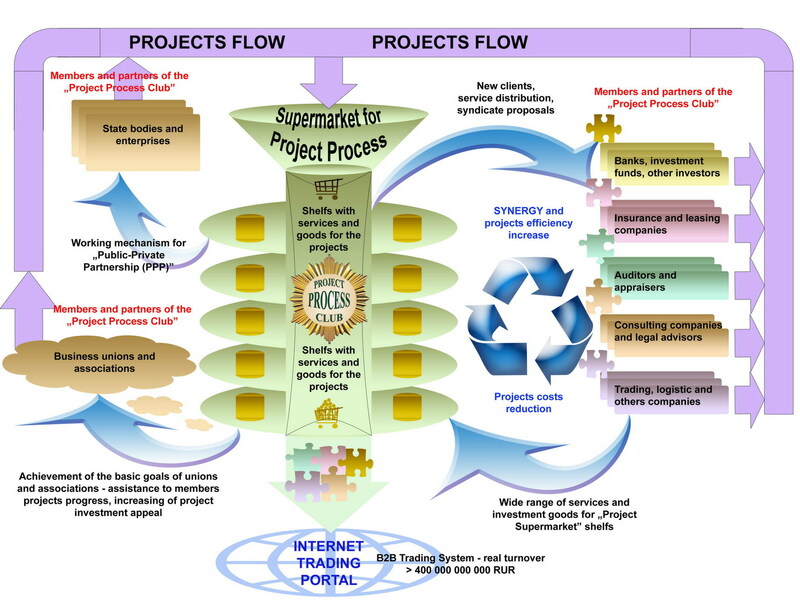 Becoming quite a “Project Integrator,” the Club is able to connect functions and services of Club organizations into a shared “Project Chain”. Furthermore, through the networking of partners (“Business Russia”, The Trade Organization of the Russian Federation, Moscow Business Association, and regional business associations), the Club is able to reach the farthest towns and regions, where each Club member individually would not have the capability to open a branch due to the scarcity of earning potentials. The Club is also a very beneficial means for banks and other investors to syndicate credits and form a portfolio of projects with the intention of securing their packages within the perspective of their future protection. § Unrefined projects overwhelm bank credit departments. Consequently, credit departments cannot concentrate on truly significant and well-developed projects, leading to a loss of profit and the decline in the productivity of bank managers. § Banks should not finance undeveloped projects. At the same time, project development should not be the responsibility of the bank itself. However, banks seldom formally deny a particular project. As a result, a vicious cycle of “raw” projects is formed, which persists from year to year and from bank to bank, without grants of credit and real help. § Problems of interaction and cooperation between banks have also accumulated. These problems prevent banks and other investors from forming a pool of investors, granting syndicated credits, and rationally distributing financial risk between banks, leasing firms, insurance companies and project participants. § Insufficient capital and short term and high-priced credit resources of Russian banks stimulates them to look for a specialized niche, to strengthen their position through syndication and the formation of a “project team” for work with large international banks and firms. § There are systemic problems in the sphere of project leadership – there is a lack of national standards for project organization and progress, as well as a lack of the specialization “project leader.” Furthermore, very few institutions of higher education have courses focused on project leading, and the structures that would have been ready to run complex “project teams” are deficient. The same structures would have coordinated the conditions of project servicing in a concrete chain of banks, insurance companies, leasing firms and other members of the team. Instead, the projects initiators themselves must independently coordinate many factors, which proves to be rather ineffective. The aforementioned problems are from inclusive of all the problems stemming from the Project process. The concern of business society with such important questions gradually led to a possible answer for these questions and the formulation of mechanisms for the solution of these dilemmas. An enormous flow of projects enters the Club. The Club’s members and partners wish to reduce the workload placed on their managers and focus only on the most prepared projects. During the process of the “separation” of this flow, the Club must show expertise in the identification of the fundamental functions needed for the project. Furthermore, the Club requires care in choosing the leaders, partners, investors, and managers of each particular project. The Club offers projects only to those clients whose individual criteria and corporate needs match the objectives of the project. This immediately raises the business efficiency of Club members. An example of wholesome work with projects, the Club has a partnership with the all-Russia organization “Business Russia.” “Business Russia” has 70 regional offices and 38 branch departments, and it constantly deals with a large number of projects. According to our mutual agreement, “Business Russia” directs project to the expertise of the Club. The Club assessment of the project is used to promote the project, which is returned to the investment sector of “Business Russia.” For the completion of the project, “Business Russia” then unites the leading private and corporate investors of Russia (Arbat Capital, IG ATON, and a group of companies titled “Region”), as well as significant international financial structures (Baring Vostok Capital Partners, Delta Private Equity Partners, EBRD, HSBC, Parex Bank, ING Investment Asia Pacific). The first standard procedure when the Club is working with any project is credit & economic expertise. This expertise checks the quality of the preparation of the project – active asset evaluation, loan insurance, audit, correctness of calculations and many other parameters. Credit expertise provides written evaluation of the readiness of the project to be accepted by the credit committees of banks, other investors, or potential partners. Most banks, insurance firms, lease and other companies agree with the fact that the majority of client requests are so low quality that they cannot be immediately presented before the credit committee without serious improvement. The important question here is who should be responsible for this improvement. Theoretically, the client himself should improve his own project, but in practice, a large part of this work is transferred to the credit department of banks. Credit managers are professionals of high qualification, and in order to provide a high percent of profit for the bank, they must be efficient in their work. The Club is useful for banks and companies selling services to projects because it is the outsourcer of their credit and administrative departments. Pragmatically speaking, the salary of the experienced manager is no less than 100,000 rubles a month, plus taxes, funds, benefits, corporate expenses. Altogether, it is approximately 200,000 rubles a months, totalling and 2.4 million rubles a year. Club membership dues are 150,000 rubles a year, meaning that even if collaboration with the Club cuts one position of credit manager in the bank, the bank receives a profit of 93.75%. The initial stage of membership with the Club – the agreement of collaboration – does not cost anything. Partners direct projects to the Club for evaluation and simultaneously receive an additional channel for the promotion of their services. If the partner and Club are mutually satisfied with their collaboration, and the partner want to use all of the Club’s benefits, then the partner may become a member by paying the Club membership fee. One of the important benefits of the Club is insurance during a supply crisis, when an excessive amount of clients are demanding services of banks or companies at the same time. Cases of supply crisis happened several times in Russia and negatively impacted the bank’s image. Supply crises are hard to predict and hard to prevent. In this situation, the Club is a good partner for the overflow of client requests. Most importantly, the bank does not lose these overflow clients, because after the Club’s evaluation of their projects, the clients would return to the bank. If a bank is ready to transfer the clients to another bank, the Club offers this service as well and can organize syndicated credit for the client. For scientific, technical, and other specialized expertise, the Club attracts independent experts and experts among the members and partners of the Club itself. The Club also establishes partnerships with specialized organizations and networks. The Club already has an agreement of collaboration with many professional organizations. In the area of assessment, the Club collaborates with the Non-Commercial Partnership "National League of the subjects of appraisal activity", Non-Commercial Partnership "Colleagues of Professional Appraisers". The Club is a member of the organizing committee of the "Union of Independent Experts in the UIS", together with Financial-Banking Advisory Committee of the UIS. The creation of an international collaboration of experts will allow the Club and many investors and projects to receive a means for the preparation and management of projects. The work of Club experts does not replace the work of credit and other departments of the Club’s partners. The Club highlights for its partners the specific questions which need special attention and this preliminary “cleaning” of the project by the Club eliminates a massive volume of unproductive work. The first result of work with the Club shows that projects, directed by members and partners of Club for expertise, have all of the typical deficiencies in their credit requests, which were explained earlier. Collaboration with the Club was extremely beneficial for its members and partners, and should be further promoted. One of the most difficult problems of projects is the search for partners, investors and creditors. Usually, the solution is found among acquaintances, which is often highly ineffective. The alternative is the Internet, and many Internet portals have created a platform for the exchange of information between seekers and providers. However, this method can be ineffective and dangerous, because a large part of the information on the Internet can be false. Real investors do not participate on these false informational platforms. For the solution of this problem, the Club proposed the special project platform which accepts projects only after the Club’s expertise and the Club’s virtual credit committee have reviewed them. The Club has already signed an agreement with the “Center of Economic Development” - developer and operator of the United System of Electronic Trade, the official trade portal RAO UES of Russia (Unified Energy System of Russia), includes 10,000 participant companies from 53 countries with a trade volume of more than 100 billion rubles. The Club’s proposed project platform will be created within the framework of the United System of Electronic Trade, which will increase the chances for legitimate projects to find investors and partners. The Club’s collaboration with the Russian Academy of Government Service under the presidency of the Russian Federation, and the Faculty of Economics of Moscow State University will ease the problem of deficiency of high-quality project managers. Foreign companies and business associations, as well as foreign embassies of countries who are interested in business development in Russia are very interested in the Club’s activities. In international work the Club cooperates with a regional organization “Union of Ambassadors of the Russian Federation”. The club has also signed the agreement of collaboration with the British-Russian Investment Club (London) and "The Foreign Trade Academy Club", which is a club of the alumni of the MBA program within the Russian Academy of Foreign Trade). The lack of insurance is the source of high risk for projects in Russia, and the Club’s goal is to increase the investment value of projects and their chances to receive credit. The Club is a partner with the largest insurance companies in Russia, «ROSGOSSTRAKH» (Russian State Insurance Company) and "ROSNO" (subsidiary insurance company of world-known Allianze Insurance Company).